The above info came from Who Wants to Know?, and was edited by yours truly (contact me). The image came from Aloha Anime. 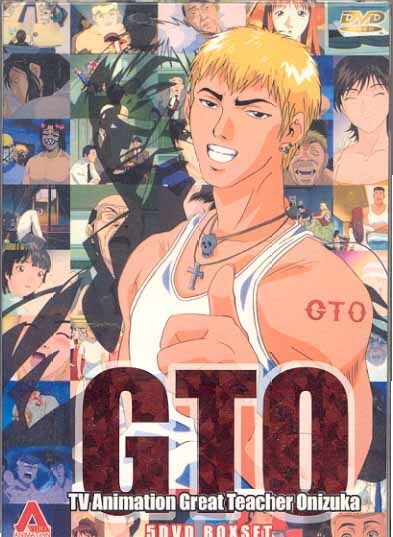 Eikichi Onizuka has decided to make a new name for himself by becoming the greatest high school teacher the world has ever seen (even if he himself still has some things to learn). So what if he's a former biker with a crude attitude, a foul mouth, and a short fuse? It just so happens that he's got to deal with Holy Forest's Hell in a classroom: a mob full of blackmailers, bullies, and assorted ilk. Between his street smarts and his diplomacy, Onizuka's out to set his students straight...and pick up girls?